Quinoa: Nutrition, Benefits, Side Effects, Facts: What is Quinoa? Quinoa is the edible seed of the plant, Chenopodium quinoa, which belongs to the genus Chenopodium in the family Amaranthaceae. Though, commonly used as a cereal or food grain, quinoa is in fact a pseudocereal, which is derived from plants other than grasses. Almost all true cereals are grasses, but, quinoa does not belong to grass family. Though not technically a grain, quinoa can substitute for nearly any grain in cooking. Actually the seed of a leafy plant, quinoa's relatives include spinach, beets and Swiss chard. Due to its delicate taste and rich amounts of protein, iron, potassium and other vitamins and minerals, it is quite popular. It is also a good source of dietary fiber and is easily digested. Quinoa grains are almost flat with an oval shape and pointed tips. There are three types of quinoa that differ in color. This include white, red and black grains and these types slightly differ in flavor too. While, black quinoa is very rare, the common and regular variety is the white one. When cooked, quinoa grain has a soft, creamy texture and a mild nutty flavor. Even quinoa flour is widely used for culinary purposes. Quinoa is an ancient crop that grows in poor soil, dry climates and even mountain altitudes. It is native to the Andes, but is also grown in South America and the Colorado Rocky Mountains. Although it can grow in arid conditions, it thrives best in well-drained soil. You should be able to find quinoa in health food stores and larger supermarkets. A quinoa grain is flat and has a pointed oval shape. The grains exist is several colorations, including yellow, red, brown and black. When cooked, quinoa expands to about three or four times its size. It also has a unique texture; the grain itself is smooth and creamy, but the tail of the grain has a crunchy texture. When preparing quinoa, you should rinse it first to remove any powdery residue. The simplest way to do this is to place the grains in a strainer and rinse until the water runs clear. For a roasted flavor, toast the quinoa in a dry skillet for about five minutes. To cook, bring one part quinoa and two parts liquid to a boil; cover and reduce to a simmer for about 15 minutes or until the grains are translucent. You can also use a rice cooker to prepare quinoa. Some people cook and eat quinoa as they would oatmeal. As a breakfast food, combine the quinoa with honey, nuts or berries. Other recipes include quinoa as an ingredient in soups, stews, and pilafs. With its slightly nutty taste, quinoa is sometimes used in bread, muffins, bagels, cookies, and pancakes. Store quinoa tightly sealed in a cool dry location or in the refrigerator or freezer for longer periods. The leaves of the quinoa plant are also edible, similar to spinach leaves. Quinoa nutritional value may vary slightly according to the way it is consumed, for example, quinoa can be eaten raw, steamed, sprouted, fried, cooked or canned. You may eat quinoa whatever way you like, health benefits offered by quinoa will be the same. Cooked quinoa nutrition facts are almost the same as raw or sprouted quinoa nutrition facts. Let us begin this write up with the basic quinoa nutrition facts. The percentage values that have been presented in the table below, are according to a 2000 calorie diet, and for a serving size of 185 g (a cup) of cooked quinoa. Quinoa is one of the most nutritious grains on this earth. It is packed with copper and manganese and is a powerful antioxidant that helps eliminate the effects of free radicals on your health. It is rich in proteins and strengthens your immune system and helps fight various diseases including cancer. Moreover, it is gluten free, so those who are allergic to gluten can include it in their diet. The carbohydrates provided by quinoa are complex carbohydrates, which keep you satiated for a longer period of time and prevent sudden rise in blood sugar levels. It is rich in magnesium which promotes relaxation of blood vessels and is therefore helpful in preventing simple problems like headache. Riboflavin (vitamin B2) present in quinoa boosts the process of energy production and also helps to reduce pain due to migraine. Anti-bacterial and antifungal properties of quinoa protect you from infections. 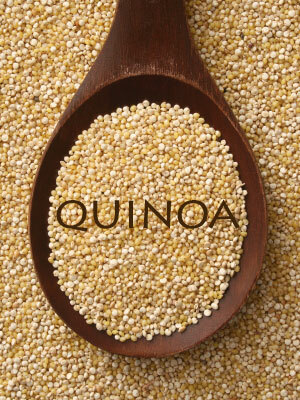 The protein supplied by quinoa is a high quality complete protein as it carries all nine essential amino acids. The amino acid lysine enhances the process of tissue growth and repair. Quinoa being a good source of manganese, magnesium, iron, copper and phosphorus, is considered as ideal and healthy food for people diagnosed with diabetes and atherosclerosis. It improves cardiovascular health and also the digestive health as it is rich in dietary fiber. It can help reduce the symptoms of high cholesterol, high blood pressure in postmenopausal women. It works great for childhood asthma. It can protect you from gallstones, and it can considerably lower your risk of type 2 diabetes. Red quinoa is a rare variety but red quinoa nutrition facts are same as described above. Now you must have realized why quinoa was once considered as the "the gold of the Incas." Quinoa can be eaten hot or cold, you can even add it to salads. Children also like the nutty flavor of cooked quinoa. Quinoa is available throughout the year. So, next time you buy groceries, don't forget to pick up a packet of quinoa. The Incas called the quinoa, chisaya mama or the 'mother of all grains'. Quinoa is rich in protein, iron, calcium amino acid, potassium and copper. They are also rich in vitamin E, lignans, phosphorous, selenium, manganese, zinc and fiber. These seeds are said to be the most nutritious food that one can get. Let us now see what are the various quinoa nutritional benefits. The tissues in our body undergoes constant wear and tear and in order to repair these tissues our body needs protein. The quinoa seeds are rich in protein which helps in repairing these tissues. These seeds contain magnesium and riboflavin which helps in reducing hypertension and migraine pain. They help the blood vessels to relax which in turn reduces constriction of the blood vessels and thus reduces stress. People who are suffering from asthma can also take in these seeds as the magnesium and riboflavin which helps in reducing tension or stress by reducing the constriction of the blood vessels, and this clears the way for air to pass, thus making it easier for the person to breathe properly. If you are into sports or if your child lacks energy, then this quinoa seeds can be given to them, as it is rich in carbohydrates which is required for producing energy. Sometimes, heart problems might arise due to blockage of blood in the arteries or veins. The quinoa contains potassium and magnesium which prevents the artery or veins from getting blocked. In turn reducing the risk of exerting stress on the heart. Need healthy teeth and strong bones? Then consuming these quinoa seeds will help as they are a rich source of calcium. That's another benefit of quinoa. Also, if you are allergic to wheat, then you can easily have the quinoa as they are absolutely free from gluten. Another quinoa nutritional benefit is that they help in proper digestion, thus it also reduces the risk of formation of gallstones. It reduces the production of excess bile in the body which is the main cause of formation of gallstones. These seeds are also low in cholesterol, hence a person who is conscious about his weight or heart, can take this without fear. The high level of fiber in the seeds help in the toning of the colon and the high level of manganese act as antioxidant, and gets rid of the cancer causing cells and also other diseases. The most important of all health benefits of quinoa is related to its high content of protein. As already mentioned, it is a complete protein meal that fulfills all the protein requirements, especially for vegans. People suffering from migraines, can benefit greatly, by making this seed a regular part of their diet. Quinoa helps in treating this problem as it is also rich in magnesium. It helps in producing a relaxing effect on the blood vessels thus, reducing the pain. Also, the magnesium content reduces the intensity of hypertension, and other cardiovascular diseases. Another important health benefit of quinoa is its abundance of fiber. It helps in weight loss, reduces risks of breast cancer in pre-menopausal women, and most importantly, improves digestion. The manganese and copper content of quinoa show antioxidant properties, and protect the cells of the body from free radical damage. Even this is one important quinoa nutritional benefit. Eating quinoa helps in maintaining an even level of energy in the body. Thanks to the riboflavin in the seed. Also, this nutrient helps in reducing attacks of migraines in people suffering from this condition. High cholesterol levels can also be controlled with the help of this seed. According to research, regular consumption of quinoa and other whole grains, is known to reduce the risk of asthma in childhood by 50%. Quinoa is likely safe when quinoa seeds are used in food amounts, as quinoa has been used as a food for thousands of years. There are very few quinoa health risks and the seeds can be used safely by most people. The seeds have a natural coating of saponins which can lead to irritation in the stomach. Therefore quinoa must be rinsed properly before use. Available reports of adverse effects related to quinoa are lacking. Quinoa may have antioxidant properties. Caution is advised when taking quinoa with other agents that have antioxidant properties. Quinoa may lower triglyceride concentrations, compared to gluten-free bread and pasta. Caution is advised in patients taking triglyceride-lowering agents.